"The resumption of the bull market has taken shape in the form of small caps. 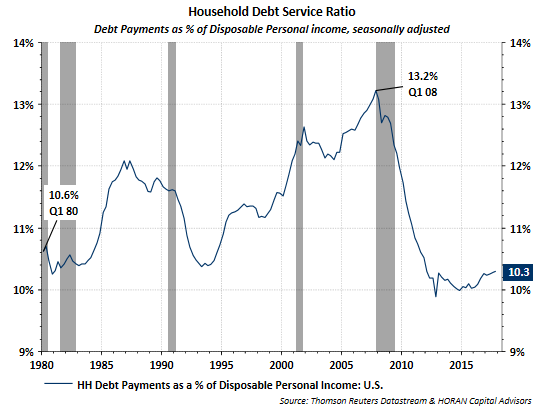 I fully expect that the rest of the market will follow suit eventually, but rising treasury yields and the surging dollar have money rotating feverishly into smaller companies and that relative strength is likely to continue." 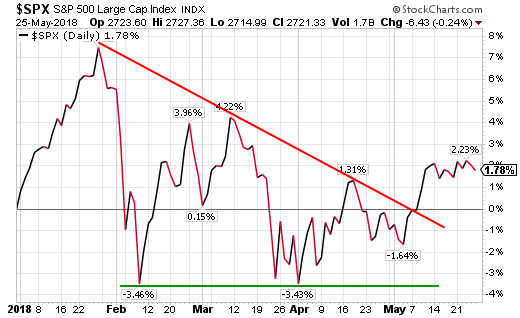 In the below chart, a downward trending red line indicates small cap stocks are outperforming large cap ones. In 2018 small cap stocks have outperformed large cap stocks while the US Dollar Index (DXY) has risen from below 90 to almost 94. This week's Sentiment Survey report from the American Association of Individual Investors continues to show a falling trend in the level of bullishness of individual investors. 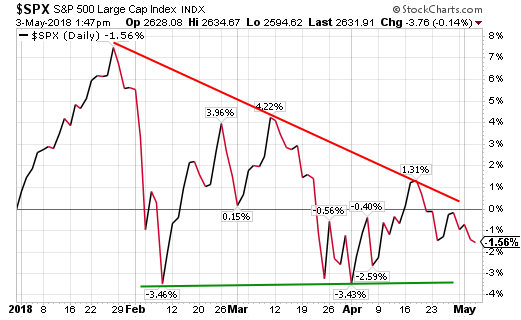 This week's bullishness reading was reported at 28.4% and down from 36.9% in the prior week. The current bullishness reading is near the minus 1 standard deviation level and these sentiment measures are most useful as a contrarian indicator at extremes. In January of this year the bullishness reading reached near 70% and subsequent market returns have trended lower since then. 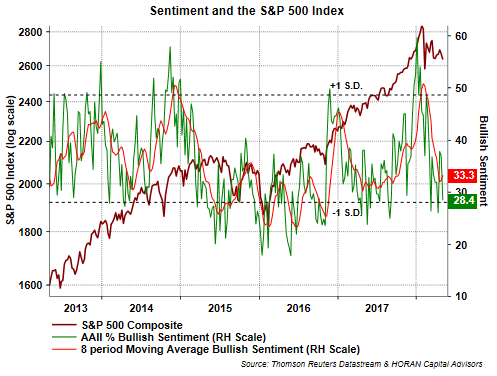 AAII published an article, Is the AAII Sentiment Survey a Contrarian Indicator?, that provides insight into the market's return at various sentiment levels. Investors are experiencing a market exhibiting a higher level of volatility. This heightened volatility is more normal than the lack of volatility experienced in the few years leading up to 2018 and yet the S&P 500 Index is down less than 2% this year.